SINGAPORE - A food stall owner who was burnt badly after his stove caught fire on Chinese New Year Eve (Feb 7) has received a handwritten letter wishing him a "quick recovery" from Deputy Prime Minister Tharman Shanmugaratnam. Mr Chiok Tiong Kwee, who runs Fo Shou Vegetarian Food on the third floor of Taman Jurong Market and Food Centre, told Shin Min Daily News he had turned on the stove in his stall at about 6.30am and subsequently stepped outside to retrieve some ingredients. But he returned to find the stove in flames. Unable to gain access to a nearby fire extinguisher that was locked, he grabbed a sack from the stall next door, wet it, and threw it over the stove in an attempt to put out the flames. The fire, however, got worse and Mr Chiok ended up suffering burns on his hands, neck and 95 per cent of his face. "I was worried that the fire might spread, so I panicked and hurriedly tried to extinguish it," he said. "It was lucky the stall was not badly damaged by the fire. The 66-year-old, who was taken to Singapore General Hospital for treatment, estimated that he lost up to $500 in earnings due to the stall's closure that day. He was warded in hospital for five days. Mr Tharman, who is also MP for Taman Jurong ward where Mr Chiok's stall is located, learnt of the incident and had a letter and hongbao delivered to Mr Chiok, Shin Min reported. 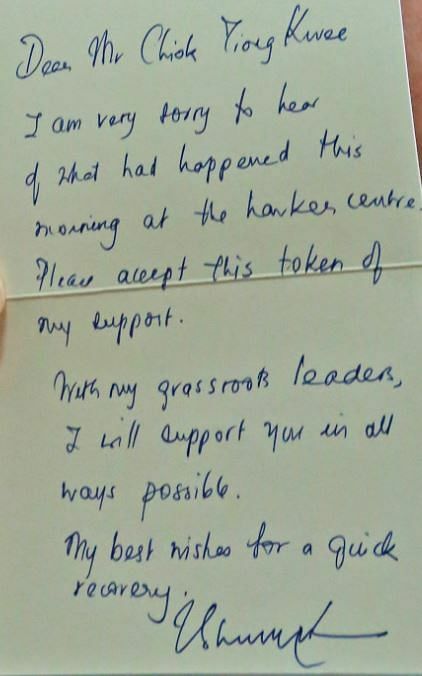 "I am very sorry to hear of what happened this morning at the hawker centre. Please accept this token of my support," Mr Tharman wrote. "With my grassroots leaders, I will support you in all ways possible. My best wishes for a quick recovery." Mr Chiok said he was "very touched" by Mr Tharman's gesture. Most of the food stall owner's face is still wrapped in bandages so as to avoid contact with water or sunlight. He has to take between four and six painkiller pills a day, and the area around his eyes is red and swollen. He also has difficulty eating and thinks it will take him about a month to recover. Mr Chiok, who has run his stall for the past 11 years, admitted that he has considered retiring. "Once my injuries have fully healed, I will make a decision on whether I should continue working."